Leonardo dos Remedios has been channeling his energy into some musical outlet his whole life. Whether it was learning the piano in his home country of the Philippines or getting introduced to rap in California just outside the city of Oakland, CA., Dos has been enthralled by the ins and outs of sounds, beats, vocals, and theories of musical composition. Throughout his carrer, Dos indulged himself in all types of music, with a collection that spanned everything from Nirvana to Tupac. This set the tone for a future filled with versatile beats and lyrics, ranging through a variety of styles and sounds. In 2006, The Combustion Lab was born. This Alternative Rock brainchild created with Alex E Punk and Melissa “Meli-Mo” Montalvo, Andres Velez and Bryan “Bam Bam Borracho” Adams marked a significant phase in Dos’ career, during which countless hours were spent pouring passion into a studio and band by the same name. During the production of their debut album in 2008, Adams was diagnosed with cancer and lost his battle shortly after. The group was devastated and never pursued completion of the album. However, there are some copies floating around of a dozen of songs from the group. The band finally dissolved in 2010. Dos joined Leins “Nome” Rios and Andres “Denzo” Arango and formed Trifekta Studios in South Florida, immersing himself electronic music and digital audio production. Over the years, Dos has evolved into a multifaceted artist with unfathomable talent and expertise. A rapper, musician, producer, and engineer, Dos is an avid piano player. 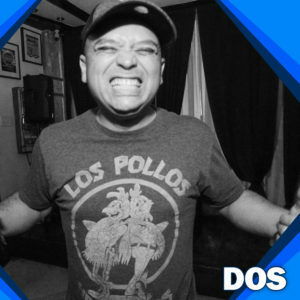 From heavy hip-hop to the roots and ruthless rap tracks to Drum & Bass and Dubstep, Dos covers all the well-known genres, and had been known to sit in with a house band and rip rhymes. His heart is in the underground scene: Grime, cypher raps, dub-ballads, hip-hop battles. His love for eclectic musical stylings is illustrated in his RnB-meets-bass-meets-jazz project, Bass in the Bedroom. When asked, he credits many artists, but a short list Tupac, Big L, Jodeci, Bjork, Nas, Outkast, Rage Against the Machine, Wu-Tang Clan, and Damien Rice as inspirations. He has personally worked alongside some of the most incredible local artists spanning a sea of genres. He has performed in virtually every club in Fort Lauderdale, many popular venues Miami and you could have found him alongside MC Jumanji and Nome at the majority of the Get Low parties hosted by Basshead Music. In 2016, he joined the American Grime family, where he has most recently been working alongside artists like MC Jumanji, Argyle Bixby, Timbo Slice, Twisty and Dev79 helping to bring Grime to the forefront of American culture.